good afternoon, I am a disabled low income individual seeking info on picking up food to help me out. What do I need to quality and dates where I can pick up food if I qualify? Your opinion matters. Leave A Review Or Edit This Listing for Sacramento Food Bank & Family Services. Sacramento Food Bank & Family Services provides a 5 day supply of emergency groceries to families in need six days per week. In an effort to better move families toward self-sufficiency, grocery items such as dairy, meat, vegetables and fruit are distributed instead of hot meals. Over 18,000 individuals receive an abundance of fresh groceries every month. Cooking demonstrations along with suggested recipes are provided to every family so clients feel empowered to use the goods they receive. Our quality groceries come from a variety of sources including donations from local grocery stores, organic farmers and the community. Food is distributed to clients in a respectful and dignified manner. Set up like an open-air, farmers' market, individuals and families are invited to see the produce, enjoy a cooking demonstration, gather health and nutrition resources and ask questions about the products they are receiving. As with all of our programs, all goods and services are provided at no cost. 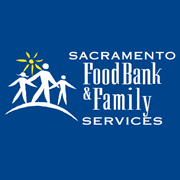 In an effort to combat many of the health ailments facing families in our community, Sacramento Food Bank & Family Services has partnered with agencies to provide health screenings such as blood pressure and cholesterol screening. Agencies also distribute information about managing diabetes and combating obesity. We always need more information on our pantries. If you know of any details, volunteer information, website, hours or more description information about Sacramento Food Bank & Family Services please add a comment (below the map on this page), with information. We will then display this for all visitors on this page.